Chassis shown off on video too - Jobs just isn't trying to hide it, is he? The new iPhone 4G / HD looks likely to pack a super high-res screen although sadly won't be using OLED technology. 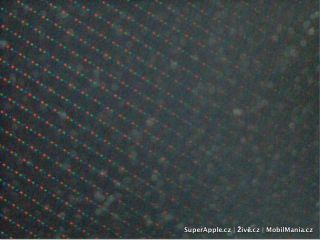 Czech site SuperiPhone has managed to nab a handset, and while it isn't working has managed to put it under a microscope and 'confirmed' a few things. It has an odd 640 x 960 resolution, rather than the more conventional WVGA 800x640 line-up. However, this means the pixels are more heavily packed into the screen, meaning a pinsharp 320ppi density - compare this to the likes of the Nexus One which only has 252ppi. The same tests also showed that the new iPhone 4G doesn't appear to have an OLED screen as anticipated, rather a normal LCD. While we're sad next-gen tech isn't being used, it does mean the LG lawsuit currently ongoing won't affect shipments. The resolution might be odd, but it means that it's four times the resolution of the current iPhone crop, meaning application scaling will be easier - although there will need to be a serious ramp up in power to keep things chugging along nicely. And if you want more iPhone excitement, how about this: a video of the chassis has apparently been shot over in Portugal (with the page now suspended). We don't learn too much more about the phone from the video, but at least it's shown as looking the same thickness as the iPad.